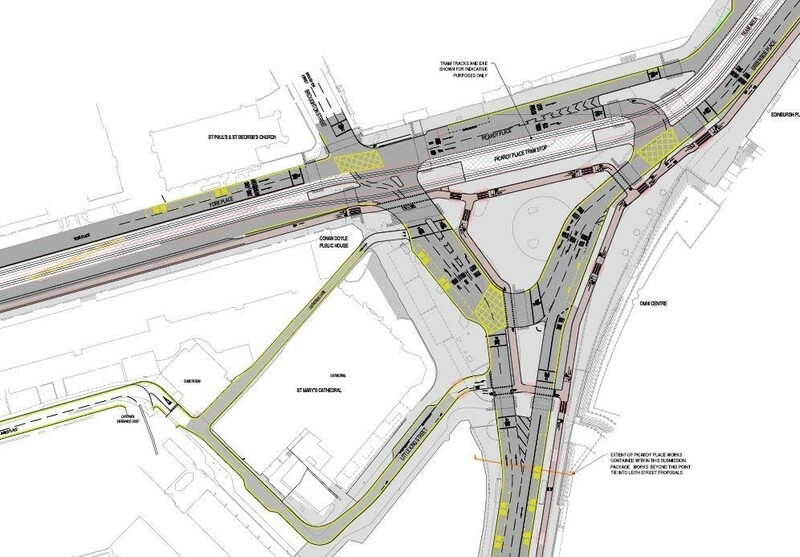 Edinburgh City Council has finalised its contentious configuration of roads and paving at Picardy Place following detailed consultations with end users. Construction work on the scheme can now begin in May for completion by the end of the year to transform the traffic island into a transport hub capable of accommodating pedestrians, cyclists and vehicles as well as a future tram link to Newhaven. Final alterations include a reduction in the number of traffic lanes, a simplification of crossings, cycle priority measures and an upgrade of traffic signaling. Optimised Environments are in the final stages of drafting public realm proposals for St Mary’s Catholic Cathedral. Glad to see there is little or no room for the inevitable architectural dross that was threatening fill the middle. Grief, not looking forward to trying to walk around there! Roads-led in the centre of a City.... what happened to Designing Streets and movement first, never mind some useable public space it’s all obliterated unless you fancy sitting in the middle of a road junction. What catches my eye is the space dedicated to cyclists. It dominates. On Leith Walk cyclists almost always ignore the cycle lanes and cycle on the road. Should have removed the Leith St - Broughton St link, allowing St Mary's public realm extending into the middle of the area. Looking at the present scheme, there is no public space left.